Thanks for watching the cake, it turned out great! Your help allowed me some sewing time so I'll share with you what I came up with. 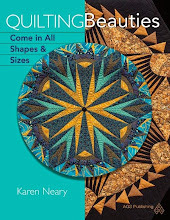 This is another scrap "patternless" project which makes a great gift. We've used homemade rice bags for years; when they were younger, the boys each had their own with flannelette covers reflecting the favourite hockey team. (Montreal Canadians and The Mighty Ducks, respectively). 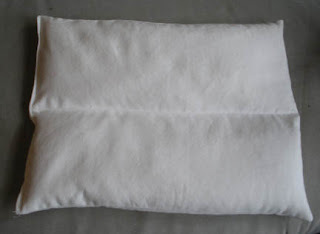 They are great for taking in the car on cold days, or tucking in bed by your feet on chilly nights. Making a removable cover allows you to launder this easily. I have a couple of different versions underway, we'll start with this Log Cabin one. Remember not to use fabrics with metallics, as the bag goes in the microwave. 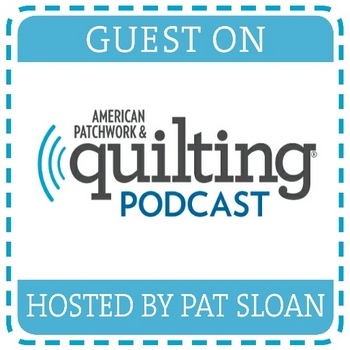 A serger is great for seams and finishing the raw edges of the fabric. Sew 1st dark to both long sides of centre rectangle, flip back to the right side and press. 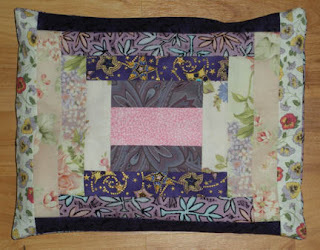 Cut a piece of backing fabric 10” x 12-1/2”” (OR the same size as your patchwork block plus 1/2” on the long end for hem). 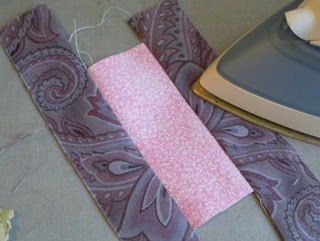 From same fabric, cut a strip 4” x 10” (OR 4" x the width of your block). Hem one long edge of this 4" strip by turning under 1/4" twice to the wrong side and stitching. Sew raw edge of 4" strip right sides together to one light end of patchwork. 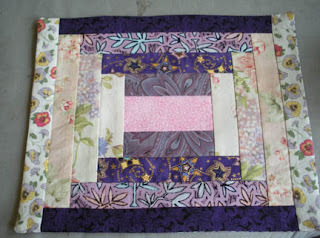 Lay patchwork and backing right sides together, making sure that the hemmed strip is lying flat against the right side of the patchwork. 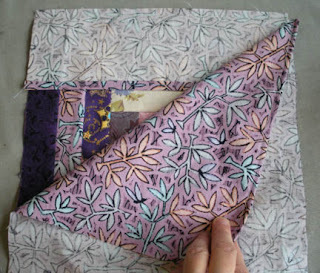 Sew along three sides, leaving the end with the flap free. Turn right side out and flip the flap down over the back. 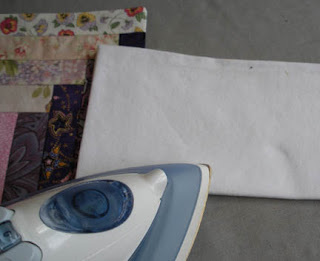 To make the muslin liner to hold the rice, Cut 2 pieces muslin 10” x 12” (or the same size as your patchwork). Sew together along 3 sides, turn right side out. 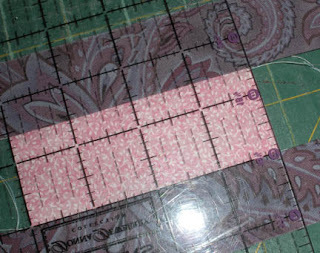 Turn in ends of bag 1/4” along top edge; press. 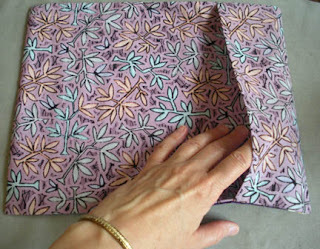 Fold bag in half lengthwise and press to mark a crease down the centre. 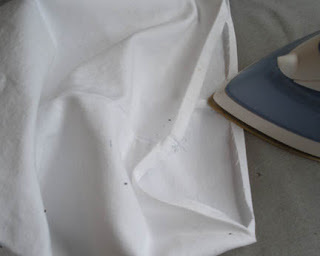 Open up and stitch along this crease making sure that hem is tucked under on top edge as you stitch. 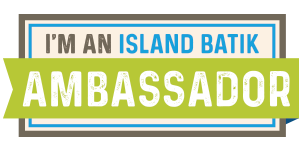 This creates a channel in the bag to prevent the rice from clumping together all in one end. 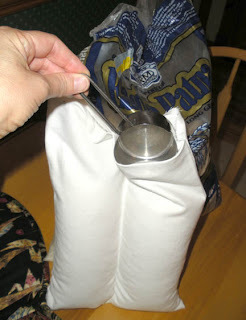 Fill each section of rice bag with about 3 cups of rice per channel; a 1/3 cup measure makes a good sized scoop for the opening. Pin top edge of bag, making sure pressed edge is tucked inside. Machine stitch along top edge to close opening. Insert muslin bag into patchwork bag, flip hemmed edge over top. Heat in your microwave for 3-4 minutes.